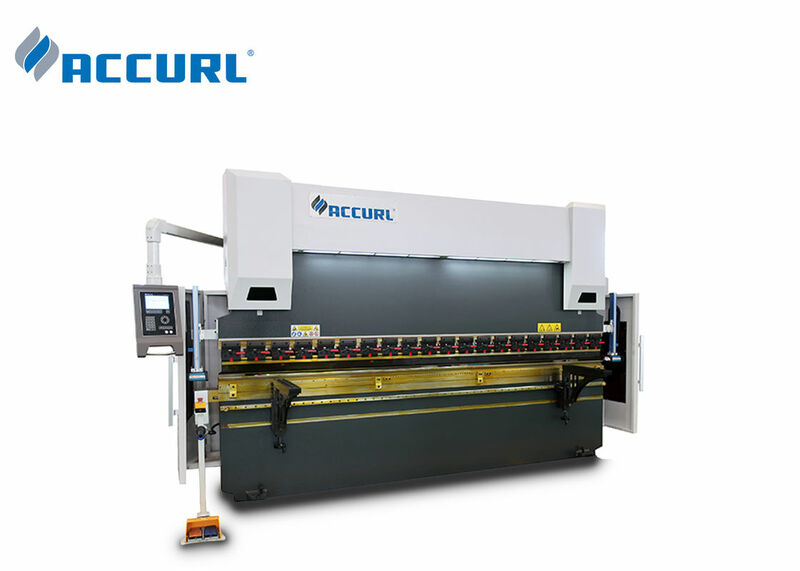 -A complete electrolyte servo synchro CNC (Computer Numerical Control) controlled press brake. - Adopt the working table compensation structure. - The CNC servo motor of the back gauge gives a high positioning accuracy. - The DA69 computer imported from Holand Delem Co.
- Automatically calculate the working time and quantities of press brake actions. 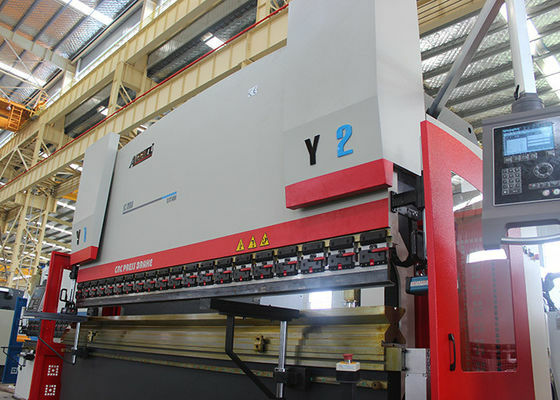 - For single step operation, the user only needs to input the relevant data into the system, and then the system will check out the pressure needed for press brake and get every thing in order. 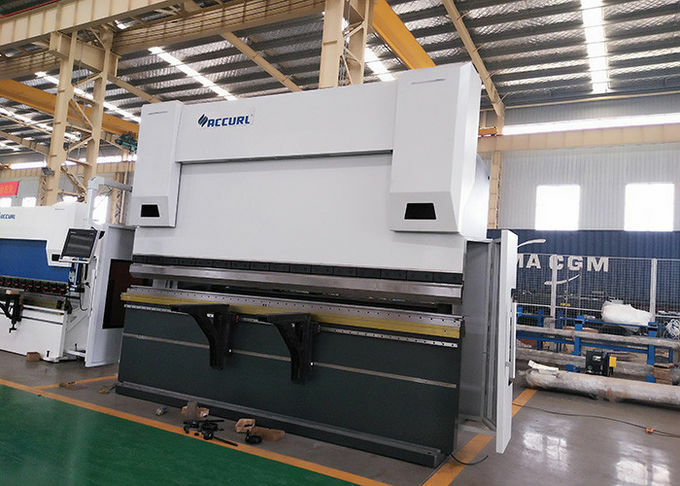 - When making several steps press brake actions on the parts, the user just needs to input the intended dimensions into the system, and then the system can make continuous press brake actions according to the requirements. - Can store 25 press brake procedures. 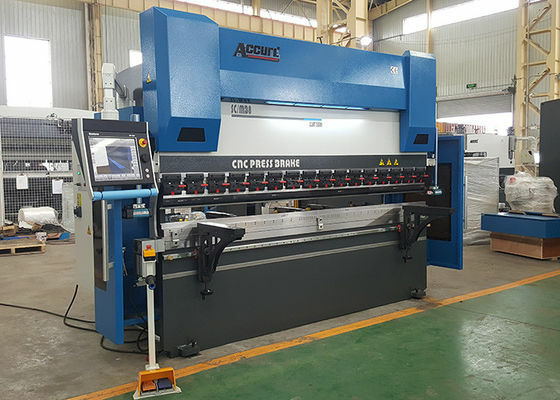 - Automatically control the following datum: Pressure discharge time, pressure keeping time, press brake pressure, press brake angle, the opening height of slide and etc. -Two light rulers (Y1-Y2) have been installed at the two sides of the machine to measure the exact distances. -The position data will be delivered to the CNC system and then it can check out the servo valve control signal (S2-S2). -The electrolyte servo system of this forging machine is an inner closing ring control system, which can check out the synchro discrepancies of the slide by the movement of the light ruler. -The electrolyte servo valve can correct the slide discrepancies, making the slide parallel to the working table. - Frame: Consist of right and left wall boards, working table, oil box, slot steel, synchronizing shaft and etc. - Slide synchro system: Adopt steel torsion bar synchro system, with high synchro precision. There are 2 synchro forks at the both ends of slide, making the movement effect balanced during operation. Brake precision is improved due to the use of upper die compensation. - This type of metal machining tool is a kind of steel torsion bar synchro press brake. Electronic control of back gauge and RAM stroke, data displayed and manual setting. 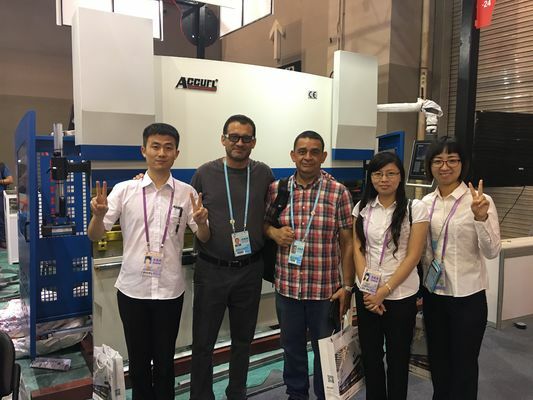 - Optional accessories: DELEM CYBELEC ModEva 15T CNC System, pendant-control-box German Herbiger valves or Italy Aron valves light curtain ball screw and linear guide of back gauge tooling clamping device.